By STEVE BASCH Three persons and an organization received special awards at the Bettendorf Knights of Columbus brotherhood dinner held at the American Legion Hall in Bettendorf Monday night. Grand Knight Jack Riley, Bettendorf, presented special awards to Cecile Cooper, Davenport, and Mr. and Mrs. Fred Epstein, Davenport and the Catholic Interracial Council (CIC) for their work in promoting goodwill and better relations of all religious, racial and national groups inside and outside the community. 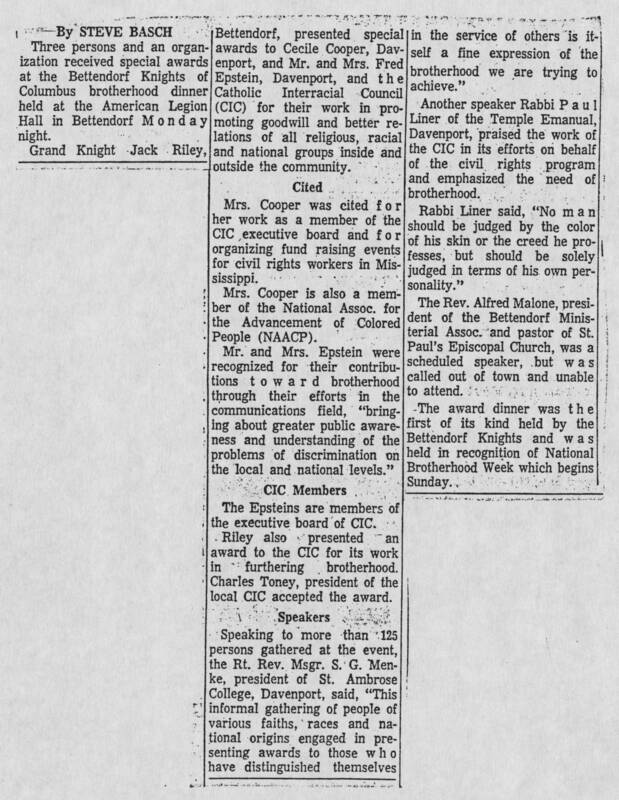 Cited Mrs. Cooper was cited for her work as a member of the CIC executive board for organizing fund raising events for civil rights workers in Mississippi. Mrs. Cooper is also a member of the National Assoc. for the Advancement of Colored People (NAACP). Mr. and Mrs. Epstein were recognized for their contributions toward brotherhood through their efforts in the communications field, " bringing about greater public awareness and understanding of the problems of discrimination on the local and national levels." CIC Members The Epsteins are members of the executive board of CIC. Riley also presented an award to the CIC for its work in furthering brotherhood. Charles Toney, president of the local CIC accepted the award. Speakers Speaking to more than 125 persons gathered at the event, the Rt. Rev. Msgr. S. G. Menke, president of St. Ambrose College Davenport said " This informal gathering of people of various faiths, races and national origins engaged in presenting awards to those who have distinguished themselves in the service of others is itself a fine expression of the brotherhood we are trying to achieve." Another speaker Rabbi Paul Liner of the Temple Emanual, Davenport, praised the work on the CIC in its efforts on behalf of the civil rights program and emphasized the need of brotherhood. Rabbi Liner said, " No man should be judged by the color of his skin or the creed he professes, but should be solely judged in terms of his own personality." The Rev. Alfred Malone, president of the Bettendorf Ministerial Assoc. and pastor of St. Paul's Episcopal Church was a scheduled speaker, but was called out of town and unable to attend. The award dinner was the first of its kind held by the Bettendorf Knights and was held in recognition of National Bortherhood Week which begins Sunday.